Perhaps because most law firms are partnerships, we don’t pay much attention to the practical implications of the partnership structure. This is understandable as there isn’t much of an alternative in our existing system at least so far as private practice is concerned. A law firm partnership is very different than most ordinary businesses. In most businesses, the owners of the business are not involved in the business whether as workers or as managers. In contrast, law firms are owned and managed by people who provide services to customers (often with the assistance of others). In a law firm, the partners are the owners, the managers and the workers. The combination of ownership, management and service provision in a law firm is particularly significant in that the partners provide the equity capital. In an ordinary business, equity capital is commonly raised through private capital or public capital. In a law firm, labour and capital come from the same source as does management – the partners. There is another important difference between law firms and most other businesses. In many law firms, it is common for more young lawyers to be hired than will ultimately remain with the firm. Of course, some law firms are simply collections of sole practitioners who share overhead and perhaps an associate who will either join the firm as another sole practitioner once his or her practice is sustainable on its own or will leave the firm. But in many law firms, a number of associates will be hired only some of whom will become partners. In these law firms, the model is “up or out” with some young lawyers becoming partners and others leaving. In the academic literature, this is sometimes described as the “tournament of lawyers”. Young lawyers compete with each other to stay with the firm. Academics once viewed this as a model applicable just to young lawyers but more recently the “tournament” has been said to continue throughout a partner’s career. Partners are said to continue to compete to continue as partners. While it was once less common, partners who are not seen as sufficiently valuable to the firm are often asked to leave. This “tournament” is said to be a highly efficient (if perhaps harsh) way of organizing people. Unlike the ordinary business where there is hierarchical management, the lawyers in the “tournament” mostly manage themselves by figuring out what is necessary to win the prize. One of my partners once described this as a pie eating contest where the prize is more pie. There must be a lot to be said for this structure as it clearly has been successful. One might hypothesize that it would be difficult to organize skeptical independent thinking professionals successfully in a traditional business organization. This structure is economically low cost in terms of management. Yet the last thirty years have clearly shown that this is not the only effective way of providing legal services. The in-house model, whether business or government, has shown that ordinary business organization can deliver effective and sophisticated legal services. The in-house law department is not owned or capitalized by its lawyers. Hierarchical management is common. The “up or out” tournament model is not used in-house (or at least to the same extent). There is of course one fundamental difference between the in-house lawyer and the private practice lawyer, namely finding work. The in-house lawyer exists to serve one client. The number and nature of the in-house lawyers is driven by the needs of the employer. For private practice lawyers, part of the tournament is finding and retaining clients for the lawyer and the firm. So what are the implications of these observations about business structure. One implication may be diversity. It seems clear that in-house law departments do a better job of attracting and retaining women and, it seems, visible and other minorities. While other factors may well also be in play, I suspect that the nature of the “tournament” model is part of the reason. Where early success is determined by attracting work from within the firm (and thereby developing and getting better work) rather than by work allocation based on reasonably objective skill assessment and assessment of potential, there is ample opportunity for unconscious bias and even actual prejudice to have effect. I recently attended a sophisticated in-house group and found the explicit targeting of diversity results to be very interesting with managers being explicitly judged, in part, on meeting targets. In contrast, it would be difficult to identify who to similar incent and judge in a law firm where, mostly, no one is “in charge”. Causing change in private practice is indeed like managing cats given the very limited actual day-to-day management in law firms. There are other significant issues to consider. In a private practice firm, it is difficult for partners to imagine doing things very differently. Why would a partner potentially render himself or herself redundant? Where a partner is mostly rewarded for their contributions to the firm, what incentive is there to invest time and effort in doing things in a way other than by partner contributions. 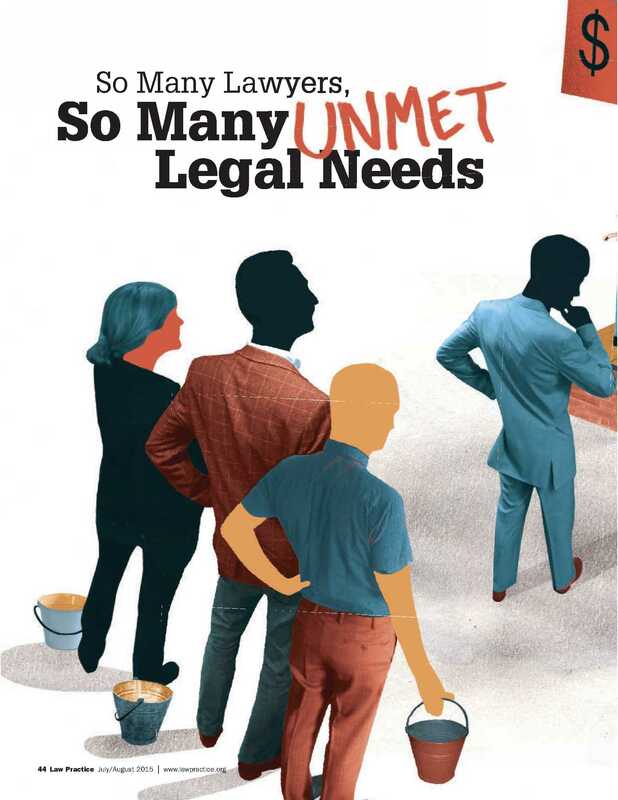 The limited extent to which law firms are truly managed means that it is difficult for truly innovative decisions to be made (and implemented) rather than to just making the existing way of doing things better. The combination of ownership with service provision is also important. In most firms, partners take out the profits annually and only keep enough equity capital in the firm as is required to provide infrastructure for existing practices. Partners have little, if any, economic interest in investing in anything that does not pay off in bettering existing practices. A significant long term investment in innovation is not very likely to provide returns for existing partners. Partners naturally prefer to enjoy the fruits of their labour (and capital). In contrast, the owners of a business with an in-house law department can make significant changes and innovations that are in the interest of the business but perhaps not in the interest of individual lawyers. We see some of these challenges to innovation playing out in what some call “new law” where ownership is separated from those providing legal services. Cognition is a Canadian example in which legal services are being provided differently and attractively to clients. While the individuals who provide legal services are being compensated for their work, the long term enterprise value is enjoyed by the entrepreneurs who own and built the business. Yet it is clearly more difficult to finance a business when equity capital is not permitted from private or public markets and is not contributed by the lawyers doing the work. This limits growth and innovation. All of this suggests to me that law firms may be particularly resistant to business and social innovation because of their nature. That said, it isn’t clear what to do with this observation if true. There is much about law firms that is clearly good for clients and for the lawyers in those firms. From a regulatory perspective, it is much easier to regulate when the owners, managers and workers are all regulated and subject to sanctions that can affect their future livelihoods. There seems to me something of a “baby and the bath water problem”. Can we encourage/permit innovation in ways that aren’t too disruptive? I also wonder if the existing model isn’t more powerful than it appears since there is clearly room for business structure innovation despite limited actual innovation. It also seems odd to me that we know so little about the business of law both from theoretic perspectives and from empiric perspectives. And so this column is more by way of musing and thinking out loud than anything else. As always, but particularly on this topic, comments welcomed! Small law firms are quite like other small proprietorships where the owner is actively involved in the business.